Committed to creating healthier lives of communities through credible research and sustainable interventions. Samarth is excited about growing and nurturing a larger research community. One of our core areas is in building capacity in social science research by offering training programmes and workshops on a variety of topics. Social Science : an area of research and practice that has evolved rapidly since the late 1980s out of a concern with the adequacy of existing methods in dealing with challenges in the health care scenario. The gradual recognition of the fact that the social and behavioural sciences together with the physical, biological and health sciences are essential for unravelling the complexity of human health, has led to the acceptance of health social science as integral to understanding and solving health problems. Epidemiology : the study of health-event patterns in a society. It is the cornerstone method of public health research, and helps inform evidence-based medicine for identifying risk factors for disease and determining optimal treatment approaches to clinical practice and for preventive medicine. Qualitative Approaches : commonly used in social and behavioural research constituting an important tool in the social scientist’s armoury. This approach basically aims to enhance deeper understanding and knowledge on a certain issue or phenomenon of interest, in the process, enabling the researcher to gain a more holistic or contextualized understanding of the problem or issue at hand. Questionnaire Development : the act of measurement is an essential component of scientific research. Researchers in the health social sciences are frequently faced with the need to measure something which has not been approached previously, or which does not have an existing gold standard against which to compare the new measure with. Understanding the issues and complexities involved in designing questionnaires will enable the development of robust measures that are both reliable and valid. Monitoring and Evaluation : are the routine processes of measuring or tracking progress towards the achievement of stated goals, and the use of social science methods to systematically investigate the achievement of a program’s results. In order to run efficiently with maximum impact, programs in the development and health sector require structured monitoring and evaluation plans, the use of strong indicators and data sources, and the application of appropriate data collection and analysis methods. Counselling : a scientific process which is largely gaining acceptance in our society as a means of professional help when faced with a problem. The problems and situations of individuals are varied and each problem has to be approached in a specific way - whether it is a vocational problem or personal trauma. Counsellors have different goals with different clients; for instance, assisting them to heal past emotional deprivations, manage current problems, handle transitions, make decisions, manage crises and develop specific life skills. A good counselor is one who is able to understand the problems and strengths of the client and help him/her in the process of dealing with the problem at hand. Samarth, in collaboration with SCARF (Schizophrenia Research Foundation) is organizing a workshop on Qualitative Research Methods and Analysis from 9th – 11th May 2019 at SCARF (Schizophrenia Research Foundation) R-7A North Main Road, Anna Nagar West (Extn. ), Chennai- 600 101, Tamil Nadu, India. Researchers in medical, social and behavioural sciences, post-graduate/Ph.D students with a medical or social science background, NGOs working in the health and development sector and any other interested professional wanting to undertake health related research would benefit from participating in this workshop. The workshop on Qualitative Research Methods and Analysis is priced at Rs.4,500/- (Four thousand five hundred) per person. Payment can be made by Wire Transfer /Demand Draft in favor of “Samarth”,payable at Chennai. The number of participants for the workshop is restricted to 35. Each participant will be provided with course material which will include the power point presentation of the speakers, adequate reading material and practical exercises. Lunch and beverages for the duration of the workshop will also be provided. Last date for receiving application is 26th April, 2019. Please note that no refund of course fee will be possible after 30th April 2019. Introduction to Qualitative Research – theories & concepts. Contrasting qualitative and quantitative research methods. Please note that Samarth and its partnering organizations have no affiliation with any of the hotels mentioned. These have been suggested purely from a location point of view. We recommend that you do an extensive search for accommodation that will match your budget and comfort. We also conduct workshops upon request on the topics of Qualitative research analysis, Questionnaire design and Research methods. The cost for the Faculty will be @Rs.8000/ per person per day exclusive of travel, boarding and lodging costs. 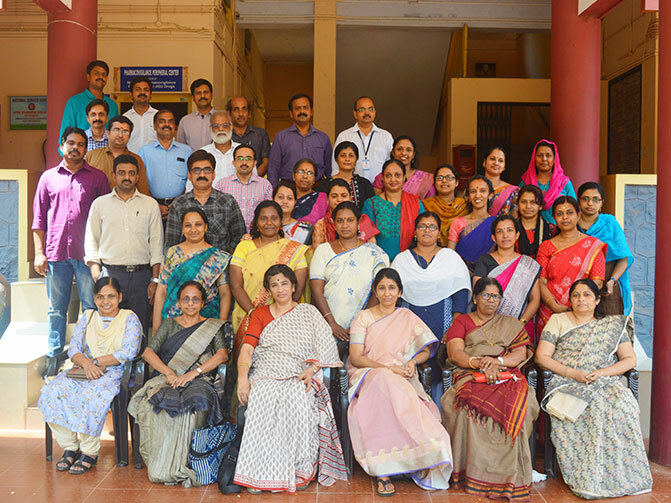 27th - 29th March 2019 Workshop on Instrument Development VPSV Ayurveda College, Kottakkal, Malappuram, Kerala. 8th - 9th January 2019 Workshop on Instrument Development National Institute of Socio Behavioral Department, (NIRT), Chennai. 31st December 2018 Half a day Workshop on Research Methods for UG Social Work students from the University of Houston, USA(Study Abroad) SNEHA Foundation, Chennai. 20th - 22nd December 2018 Workshop on Qualitative Research Methods Sankara Nethralaya, Chennai. 13th - 14th November 2018 Workshop on Instrument Development SCARF (Schizophrenia Research Foundation) R-7A North Main, Anna Nagar West (Extn. ), Chennai- 600 101, Tamil Nadu, India. 8th – 10th May 2018 Qualitative Research Methods and Analysis SCARF (Schizophrenia Research Foundation) R-7A North Main, Anna Nagar West (Extn. ), Chennai- 600 101, Tamil Nadu, India. 4th - 5th Jan 2018 Workshop on Research Methods SCARF (Schizophrenia Research Foundation) R-7A North Main Road, Anna Nagar West (Extn. ), Chennai- 600 101, Tamil Nadu, India. 15th – 17th May 2017 Qualitative Research Methods and Analysis SCARF (Schizophrenia Research Foundation) R-7A North Main, Anna Nagar West (Extn. ), Chennai- 600 101, Tamil Nadu, India. 14th May 2017 1 Day Workshop on Guide to Journal Publications SCARF (Schizophrenia Research Foundation) R-7A North Main, Anna Nagar West (Extn. ), Chennai- 600 101, Tamil Nadu, India. 11th – 13th May 2016 Qualitative Research Methods and Analysis SCARF (Schizophrenia Research Foundation) R-7A North Main, Anna Nagar West (Extn. ), Chennai- 600 101, Tamil Nadu, India. 14th May 2016 1 day Workshop on Guide to Journal Publications SCARF (Schizophrenia Research Foundation) R-7A North Main, Anna Nagar West (Extn. ), Chennai- 600 101, Tamil Nadu, India. 1st to 2nd February 2016 Workshop On Research Methods Organized by Samarth at Sundaram Medical Foundation, Annanagar, Chennai. 2nd to 4th November 2015 Workshop on Instrument Development Samarth-SCARF Collaboration SCARF’s Training and Resource Centre located at: First Floor, Greams Dugar Apartments, # 149, Greams Road, Chennai – 600006, Tamil Nadu, INDIA. 6th to7th Jan 2014 Training in Qualitative Research Methods for research team (as part of the NIMH-Diabetes-Depression study) Madras Diabetes Research Foundation (MDRF), Chennai. 1st to 2nd Jun 2011 Qualitative Research Methods for I-TECH Fellows GHTM, Tambaram, Chennai. Copyrights © SAMARTH. All rights reserved.